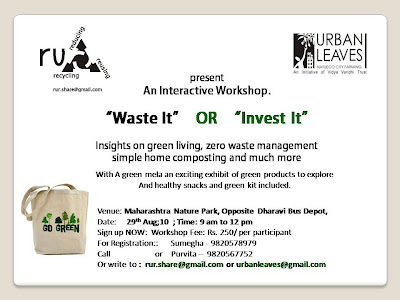 Monisha Narke will be conducting the workshop. Monisha is an active 'Green' practitioner and mentor who has been working on zero waste issues since the last few years. A neighborhood environment forum Initiated by young mothers, --- for bringing people together to protect our planet. Don't forget to carry your water bottles and a " green mind" to the workshop !